The Carrie In Writing blog has relocated! Click here to reach the new website. I rolled it around in my brain for a day, considering others but returning to this one. I mulled over why it was the strongest contender. What did it mean for me? How might it affect my year? It nestled into my consciousness and I decided to let it stay. The more I thought about it, the more I wanted to share it with you on this blog. As I sorted out my musings into readable paragraphs, I also tried to find a good quotation to use to introduce the idea. It was a rare occasion of Google failing me. What I found was quote after quote affirming a person's self-worth. I am worthy. You are worthy. On and on and on. We have a crisis of self-worth. This isn't news. It's been going on for decades and only getting worse. The misguided responses of rooting out all humility and lasting, God-given identity haven't exactly helped. All these people attempting to answer this crisis. At first it seemed like there was nothing applicable to my theme for the new year. I wasn't looking for an affirmation of self-worth. It is exactly because of my belief in my own worth that I chose this word. Then I realized that maybe, just maybe, this new year's theme is a piece of the puzzle of living in a manner that says you know your worth. 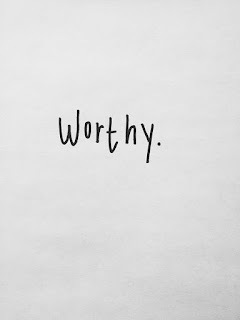 I chose WORTHY because I am tired of giving of myself to things that are not worthy of me. I'm tired of being tired - physically and mentally. I, like many people, have trouble saying no to or stepping away from that which isn't worthy of a portion of my reserves of time, energy, attention, and care. In the coming year, I hope to retrain myself to an extent. Give myself only to what is worthy - be it activities, hobbies, relationships, responsibilities, worries, thoughts - and within the collection of what is worthy, spend myself to an extent that is proportionate to each one's importance. Not everything and everyone is worthy of what I have to give, and not everything and everyone that is worthy is equally worthy. At the close of 2017, I aim to have this a bit more sorted out than I do now. The end result, I hope, will be less of that tiredness I mentioned, yes, but also a better ability to pour myself out for what is WORTHY because I am not wasting myself on what isn't. Where else can you find Carrie Sue? I'm Carrie Sue, a midwestern girl who loves three things above all else: God, my family, and the written word. To edify, influence, entertain, or teach, the written word is my tool of choice. Here at Carrie In Writing, I muse on life, love, faith, and everything in between. I also compose short fiction pieces for your enjoyment. My debut novel is scheduled for release in 2018. I shall (excitedly) share details as the publishing plan is confirmed. I'm glad you're here and I hope you enjoy what you read! Please leave comments, subscribe by email in the top right corner, and most especially, if there is a post that resonated with you, share it with others online!